I don't really know if there's anyone who would want to do this, but I guess it's worth a shot. 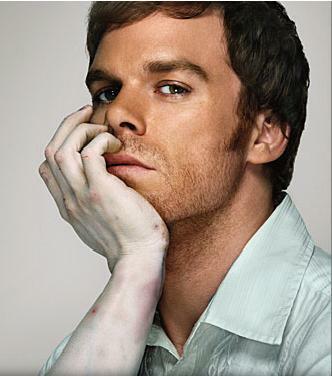 I'd like a avatar and signature set for the show Dexter. It should have Dexter in it and I'd like there to be a few blood spatters (as that is kind of relevant to the show) and a white or light background if at all possible. Here's a few images you could use if you'd like. The first one would probably be best as the avatar. Or anything really...those are just a few samples of the person you should be looking for when you type in Dexter on Google. 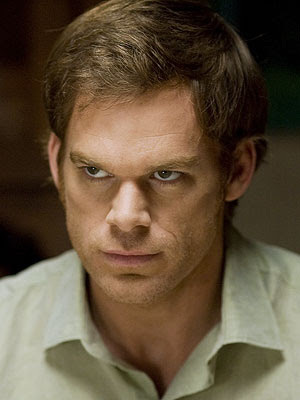 You don't need to strictly follow my guidelines or anything, those are just preferences for what I want, as long as it is a Dexter set I'm cool. Thank you to anyone who might be willing to give it a shot! I was wondering if someone could make me an avatar with the logos for Glee and Torchwood. If it's possible to squeeze my name in there that would be great. Take creative liberty. Really appreciate all the work you all do on this thread. Last edited by theotherslover on Tue Jul 20, 2010 1:44 pm, edited 1 time in total. Hello, I would be very happy if someone could make me an avatar of Miles (from Lost). I don't have any picture but if it's possible I would like to have a picture of him from the scene where he is duct taping the plane together in "The End". It would also be cool if the words "Miles is my hero" could be incorporated since that's my username. Last edited by milesismyhero on Mon Jul 12, 2010 10:39 pm, edited 2 times in total. Oh, also came to think of a signature banner that I would love if someone could make for me. I want a picture with some of the original castaways (preferably some or all of Jack, Kate, Sayid and Sawyer) while they are on one of their many treks through the jungle. I would also be great if they where running or at least looked like they where in a hurry since I would like the text "If you need us we'll be running through the jungle" featured in the bottom of the banner. I know this request might seem a bit unclear right now but I hope that you at least get a feel of what I'm looking for. Wow; this thread really hasn't been updated for quite some time! milesismyhero, theotherslover and DestinyFound; expect your requests to be finished by tomorrow! What I'm asking might be a little complicated but I have faith in you dudes! The LOST has ended and I'm coming close to the end of "The Dark Tower" (please don't spoil the ending for me). So recently decided to show everyone my excitement in those things. I would really be pleased if you could make me a LOST/DT symbol. For the base you can use DHARMA logo (I prefer the modern one but the classic is still fine) but in the middle should be the symbol of DT - keyhole with the rose inside of it (I believe this will be tricky cause you somehow have to make it 2 colored ad so (as in all DHARMA logos) but I only found this which, I believe, won't translate in DHARMA-logo's-center format easily but this, which undoubtedly preffered, is only available as photograph - really hope you could make into the logos center). On 12 o'clock you could put this symbol (that's why modern logo is prefferable - at least there you have space) which means unfound. On other segments you can throw in The Numbers but this time including 19 there somewhere. Also a few other symbols like these: 1, 2, 3 and 4. Most of those should be barely seeable (only with some cool contrast/brightness adjusting technic which was used in one ARG). And at 6 o'clock segment just put my nickname in - kristaps194. And, if you get really into that logo's making, you can make a few signs featuring it - for me or for everyone's use. I would enjoy Charlie (while he's drowning in the Looking Glass) with words Go then, brotha. There are other worlds than these. Let your days be long and nights pleasant, sai! I think my request has been overlooked? I'd like to have the TARDIS added my current 815/Observer sig. I've tried but I'm crap at this sort of thing. Finli Otego wrote: I'd like to have the TARDIS added my current 815/Observer sig. So let me know if I got, you want the same sign plus this tardis thingy, right?? If you want me to put the tardis in some place else in the pic just say so ok? hope you like it! I've been wanting to update my avatar for a while. Previously, I had a couple of Lost related ones, and I created my current one for the World Cup. However, with the TV season starting, I need a new one. I would be most grateful if some clever kind person could mix me up a Dexter/Trueblood sig or Avatar whatever is easier? Is this something someone could do?